Thanks everyone who ordered a shirt. Ill have them out in a couple of weeks. 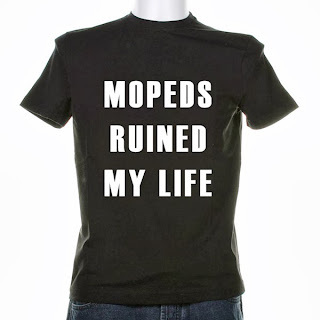 If your like me, MOPEDS RUINED YOUR LIFE! Order one of these shirts or more! 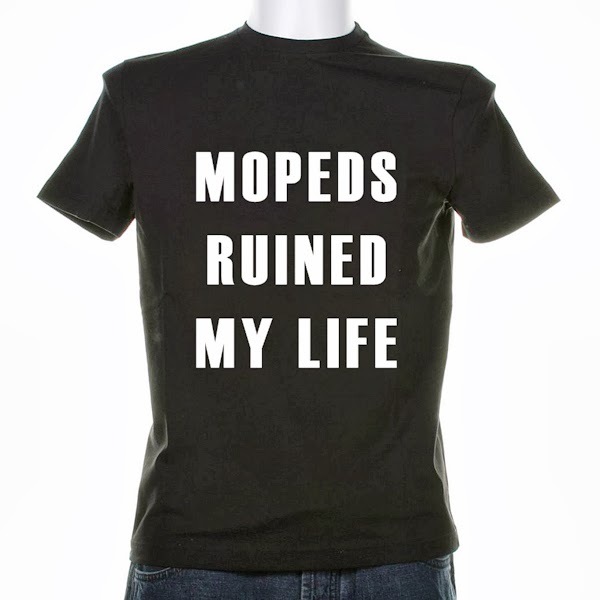 They will all be printed at once and shipped at one. Sometime in September. These are pre-order only. "You Snooze, You Loose"
If you want a shirt please order one. I WILL NOT BE MAKING EXTRAS. SALE ENDS end of August! Note: If you want multiples you can edit quantities in your shipping cart. If you want different sizes, just go back and add another size. Making all purchases in single orders will help me assure correct shipment. Thank you. I WILL NOT SHIP TO OTHER PARTS OF THE WORLD UNLESS YOU CONTACT ME FIRST. WILL, you can because your rad! want to cut it up and make a shirt that says "I'm a transvestite and i pack a gun"
I want to put it on my manikin model boyfriend. I want to make a shirt that says "Maize ruined my life"
Stop making fun of Maize he is a person of great quality and stringent morals. how about you hide behind your anonymous name FOREVER! "MAIZE'S MOM RUINED MY LIFE!!!!" How bout you go ruin your life with a corn cob. Corn Cobs Ruined My LIFE!!! !